Cover story, Dec. 28, "The Year in Photo Review"
Loved the photo highlights in this one. News, Dec. 28, "Free Friday Face-Off"
The only thing I pulled from that, is our mayor has never used his own cities public transport—and that says something. Love this place, amazing vegan food. Seasons is one of my favorite vegan spots in the Valley. Glad to see they are getting the positive attention that they have earned. Vegan Italian and French cuisine? I need to try this. Cover story, Nov. 30, "The Rise and Rise of Cliven Bundy"
Mormon terrorism is now legal. If he ever steps foot in Oregon, they will shoot him. Blog post, Jan. 3, "Thanks for the Memories, Orrin!" Follow the money and you'll know where his true values reside. He's sold out every citizen of the state, as well as the nation. He is only interested in lining his own pockets. He will be remembered as one of the oiliest, greasiest, dirtiest, most duplicitous and least honest of all senators. Forty-plus years of stroking his ego. He's an embarrassment to Utah. He may have started out with good intentions, but once he got sucked into the Washington way, it became a money-grab. Fortunately for him, we still get to pay him (and his benefits) for the rest of his life, so the money train has no end in sight. He did what all the rest of them do: absolutely nothing. Now, if we could just get Trump to retire. 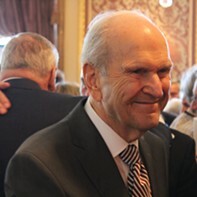 Blog post, Jan. 3, "LDS Church President Thomas S. Monson Dead at 90"
I'm Bishop Kamara of the Crystal Palace Ward. On behalf of the Ward members, we are sending our condolences to the family and closest friends of our dear and beloved President Thomas Monson. May his soul rest in peace. While I am saddened for his family, his platform while leading the church directly led to so many troubles for the LGBTQAI+ community. I hope the leaders of the church will come to their senses with the next leader. He did good, but he also did ill. The later will be neglected to be talked about. I do feel that part and parcel of the issues, however, stem from him being ordained as a bishop at 22. Far too young to even know himself. Too bad we can't lower the flag for all the LGBT people who took their own lives because of this man and his followers. Let the Hunger Games of the First Presidency commence! This fool was no prophet. You don't become one based off your donations or length of time in church. We encourage you to join the conversation. Voice your thoughts on stories posted across our social media platforms, as well as this here website, for a chance to be featured in this section.